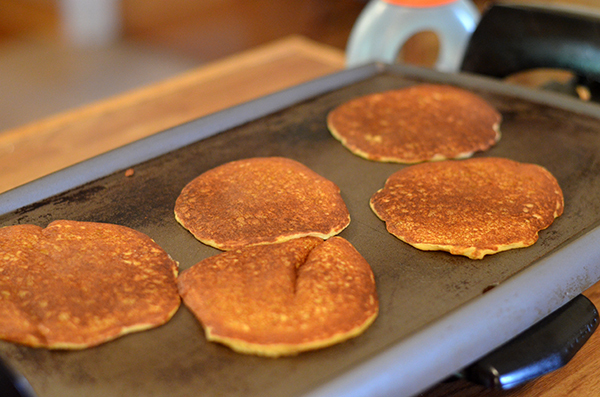 These days my favorite way to make pancakes is with coconut flour. I love the flavor and texture. If you’re not a huge fan of coconut flour, you probably won’t like these. Sorry – just thought I would clear the air right now. And yes, these do taste like coconut. I’m on a roll! 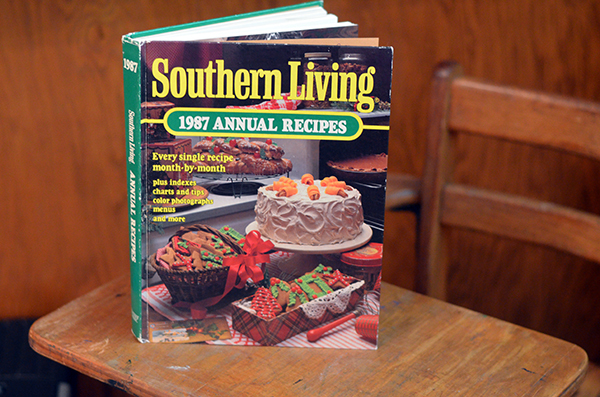 This week in my stash, we’re just barreling right on through my Southern Living collection – tackling 1987 this time (FTC, that’s an Amazon affiliate link. Am I the only one who hates all these disclaimers?). My sister was born on January 1, 1987. A day that will live in infamy. It was in the middle of the night and my dad carried me next door to my aunt and uncle’s house without any socks on. I complained. Yep…we started off great, huh? But really, 5 year olds are very concerned about socks and such. 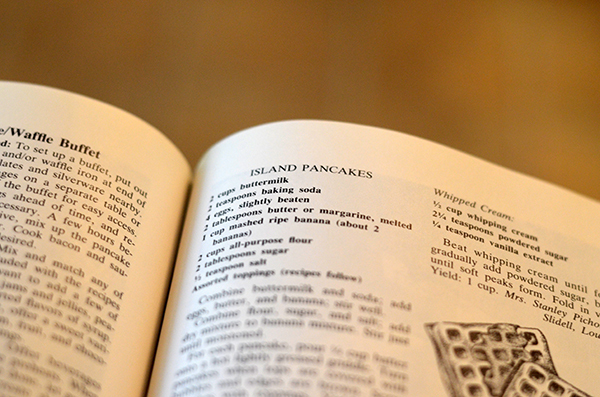 I chose this recipe for Island Pancakes because it sounded fun and it was about 45 degrees outside. I hate being cold, so I thought if I ate Island Pancakes it would make me feel hot. Guess what? It didn’t work. I switched to coconut flour and I used kefir instead of buttermilk. I also added some kickin’ toppings and extracts. I am currently in love with extracts of all shapes, sizes, and flavors. So, watch out – I’m just sayin’. 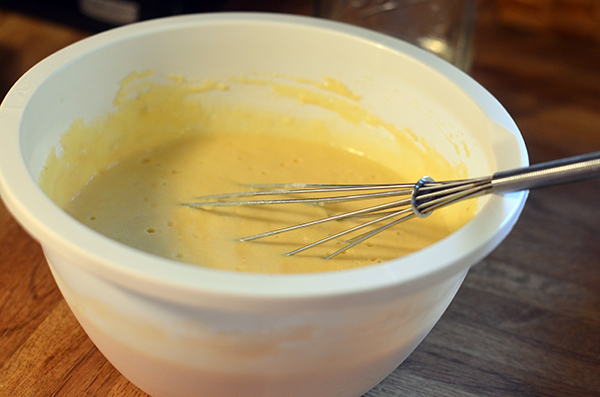 This is a very thick batter. So, when you spoon it out, you might have to use the back of your spoon or measuring cup to form your pancakes. It’s great fun! I’ve already told you I’m somewhat obsessed with coconut right now. I look for reasons to add it to stuff – which is likely why this recipe leapt out and grabbed me. 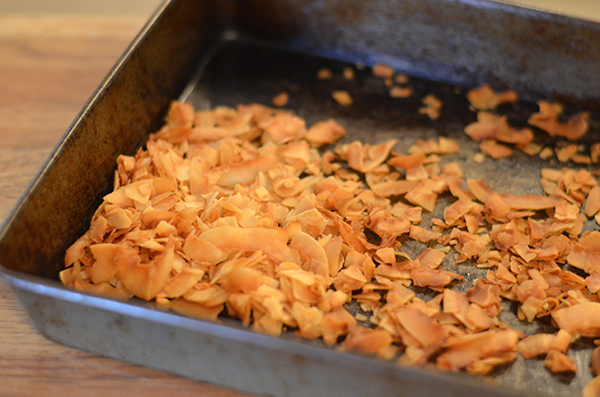 But really, if you’ve never toasted coconut chips – man alive…you have no idea what you are missing. They are life changing. And they make happy pancakes. 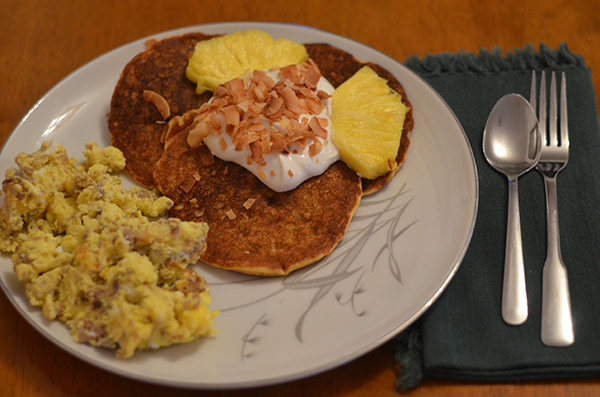 Instead of syrup, I topped our pancakes with a tropical yogurt. I buy plain Greek yogurt and sweeten it with stevia. And for this “island” version, mon, I added pineapple extract. I loved it. Andy loved it. Barry liked it. Annie almost gagged. You can please some of the people some of the time, but you can’t please all of the people all of them time. On a cheapy note – look at your local ethnic stores for good deals on extracts and spices. Public service announcement. Now, go forth and flip small pancakes and burn coconut. You’re welcome. Heat oven to 350 degrees. Pour coconut onto baking sheet. Toast for 5 minutes or until browned. Cool. Combine coconut flour, sugar, and salt. Whisk well to remove lumps. In a separate bowl, combine kefir, baking soda, eggs, coconut oil, and extracts. Whisk well. Stir liquid into flour. Stir until moistened. You will have a thick batter. Fry ¼ cup portions of batter on a greased griddle. Turn when almost done and fry until done. Keep pancakes warm in oven. 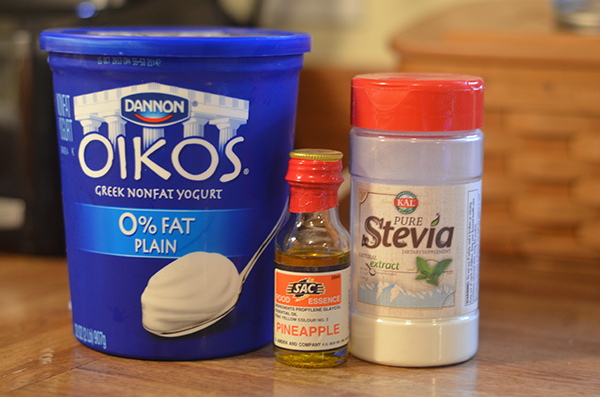 Prepare yogurt with stevia and pineapple extract. 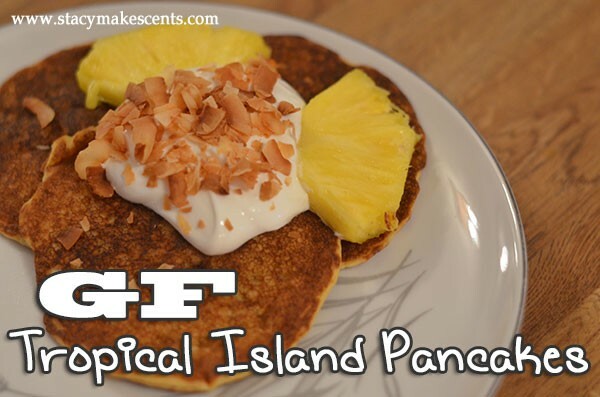 Serve pancakes topped with yogurt and toasted coconut. These sound SO good!! I’m addicted to almond joy’s during the winter months because they remind me of the beach. This will have to make it into my breakfast rotation! Thanks for the great recipe! I love coconut too and these look great! Thanks for sharing on the weekend re-Treat link party! I just love the flavors for your pancakes! Hope you are having a great day and thank you so much for sharing with Full Plate Thursday! We are having 19. Tuscan Vegetable Soup Recipe | practical-stewardsh for dinner tonight! What an amazing dish! Love all the subs you changed up too. Pinning! Hi Stacy! I am so glad you opened the criteria to the link party up! Blessings! This looks amazing and I love the cookbook. We picked up an old cookbook called the Joy of Cooking for 5 bucks at the flea market. It is awesome! First published in 1931 and full of good stuff! Can’t wait to try to tweak some of the recipes in it. You are inspiring! I love the fact that you are posting gluten-free sugar-free recipes. My family and I just recently changed our lifestyle to eat this way. My problem is that my husband is allergic to both coconut and almond- which one or the other or both are found in so many of the gluten free recipes. I know everyone says experiment which other ingredients in their place, but other gluten free flours/oils are expensive and I really can’t afford to have too many inedible experiments, if you know what I mean. Anyhow, if you would occasionally try to throw in some recipes that don’t have either ingredient, I know I would be blessed. Thanks ! I do not and never have liked pancakes, or syrup, for that matter. People are shocked when they find out I don’t like either of them. You can’t help it if you don’t like the taste of something, it isn’t like we pick and choose, saying ok, I won’t like pancakes but I will like liver (YUCK!!!). Anyways, I have never made pancakes in my life (gasp! ), that was something my late husband used to do for himself and the children. So I was wondering if I could convert this recipe to something I would like and would be willing to make for myself. Thank you for your help and for such a great website. Sure – go for it….but keep in mind that it might not work. 🙂 Then again, it might be awesome.